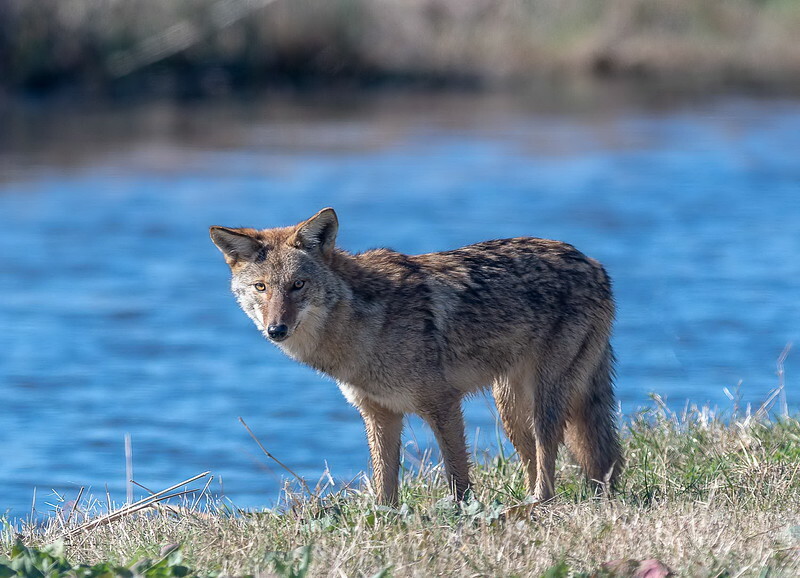 While I was driving around Shoveler’s Pond at Anahuac National Wildlife Refuge, this coyote came strolling down the road without a care in the world. His full attention was on a group of coots that were on the bank of the pond; obviously thinking about lunch! I rolled the window down on my car and started taking images. He was almost too close for the lens I had attached to the camera. Great shot of this beautiful coyote--love his golden eyes. I'm not sure I've ever been close enough to see the eye color. Looks like he's either waded in the water, or has been walking through wet grass. Lucky you! That's a great shot of this fellow. He's almost looking at you. We live outside of town and at night we hear them quite often. Superb shot of this healthy looking coyote; lucky to get to close! Lovely portrait and great light. Fabulous capture! Love the details on that beautiful face.